Artificial intelligence: threat or saviour? This was said at the University of Pretoria’s fourth Flexible Futures Conference, by Prof Peter Cochrane, Professor of Sentient Systems at the University of Sussex, Ipswich, in his keynote address, Artificial Intelligence: Threat or Saviour? The theme of the conference was Technology-enhanced Innovation in Teaching, Learning, Assessment and Student Success Strategies. It aimed to direct attention to teaching innovation, with a focus on current innovations in the use of e-technologies in teaching and learning. The other keynote speaker was Johannes De Gruyter, Executive Director of Academic Innovation at Portland State University, United States, who spoke on Centres for Teaching and Learning in Times of Change. 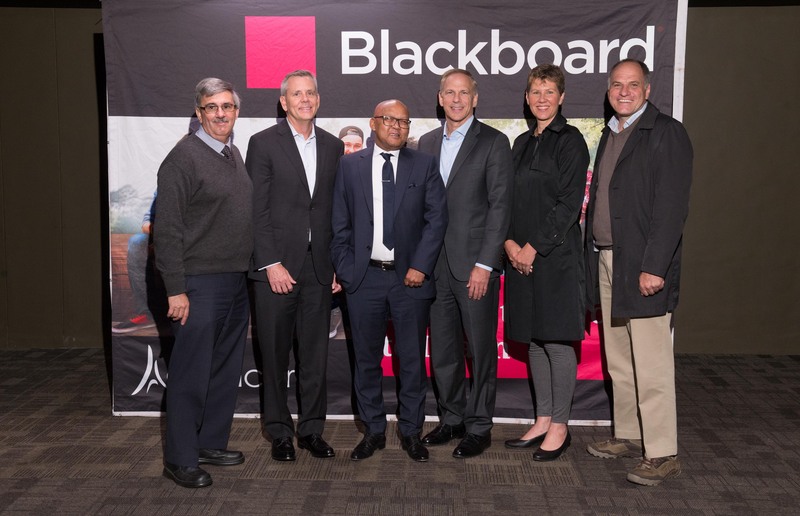 Dolf Jordaan, UP Deputy Director E-Learning & Media Development; Lee Blakemore, President of Global Client Operations & Success at Blackboard Inc; Prof Norman Duncan, UP Vice-Principal: Academic; Mark Gruzin, Blackboard’s President of Global Markets; Prof Salomé Human-Vogel, UP Deputy Dean of the Faculty of Education and Prof Gerrit Stols, UP Head of the Department of Science, Mathematics and Technology Education at the conference. What is certain for Prof Cochrane is that “we can’t power into the future on the basis of polishing our old industries and processes and making them more and more efficient: such a path only slows down the rate of demise, and delays the day of reckoning. The big change needed hinges on the realisation of new materials that do not occur in nature; they're shaping and forming into products with a very high efficiency of ownership and operation during their life”. Prof Cochrane says AI is already discovering new materials and structures, while solving problems that are way beyond human capability. “Today, we are at the peak of industry 3.0, and we can progress no further. But even so our abilities are already formidable, in that we are able to design and build over 2 billion mobile devices of incredible complexity (greater than a Cray-3 supercomputer) and ship them to global customers working across multiple networks and standards.” AI’s ability is also reflected in every aspect of human activity – from the manufacture of furniture, domestic appliances, and office machinery, to vehicles, aircraft, and transport systems. He said while society has progressively achieved far greater performance with far less materials at lower energy costs than ever before, this cannot continue without the fourth industrial revolution and AI. 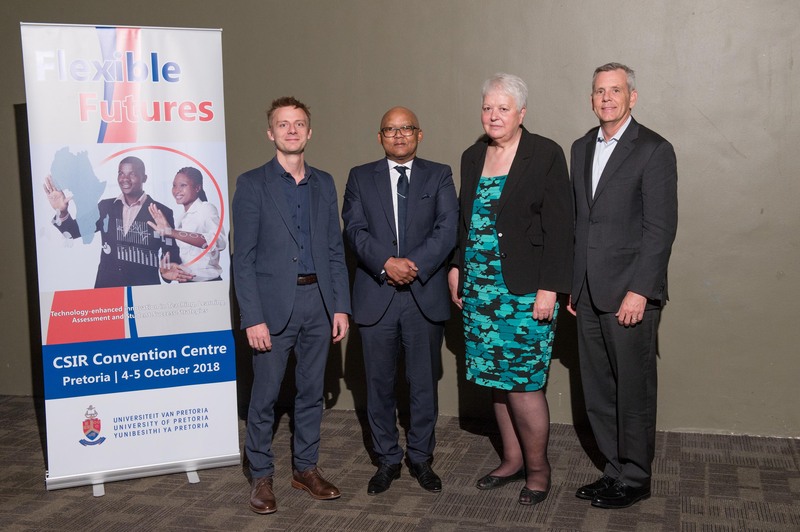 Keynote speaker, Johannes De Gruyter; Prof Norman Duncan; Prof Wendy Kilfoil, former UP Director for Education Innovation and Lee Blakemore at the conference.